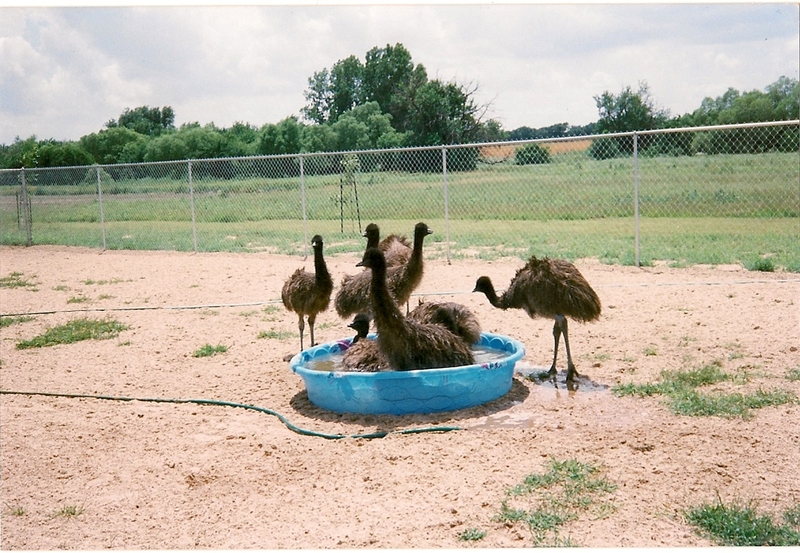 Emu Chicks enjoying a Summertime dunk in a pool. Kalaya Emu Estates is a farm located near Hesston,Kansas where the emus are raised naturally in a free-range environment without hormones and antibiotics; and are fed a high-quality nutritional feed, specially formulated for emus. The business was established in 1994 for the welfare and satisfaction of our customers. We sell a full-line of name brand emu oil products for humans and pets; USDA approved healthy low-fat red meats; leather goods; emu egg and feather craft supplies at retail and wholesale. Throughout the year, we sell online and at Farmer's Markets in the area. We are an Accredited Emu Producer and members of the American Emu Farmers, Kansas Grown Farmers Market, Reno County Producers Market, and South Hutchinson Farmers Market. Raising emu chicks, yearlings, and breeders for sale. Emu eggs for incubating sold during egg laying season (November to March). Retail, wholesale and mail order sales of American Certified emu oil, emu oil products, USDA inspected low-fat emu meat, blown emu egg shells, feathers, products for dogs and cats, and emu leather. Click on Shaklee Products to learn more about these excellent products. We offer products in harmony with nature and good health. The Shaklee Difference is in demanding and providing the best and the purest ingredients and by setting the highest of standards. Reno County Producers Market, Inc.